Get relief without surgery or drugs! Fill out the form on the right! if you send in your info today! Please complete this form for more information by email or to receive a call back from KevMed. Please contact me by Email for more information. 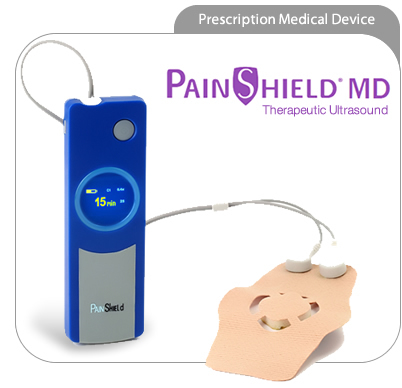 PainShield MD produces low intensity ultrasound which deeply warms tissues and helps to relieve muscle spasms. Unlike conventional ultrasound, where treatment is limited to the few occasions that a patient can visit a therapist's office, PainShield MD Therapeutic Ultrasound functions like "slow release ultrasound" that patients can wear while going about their day. Multiple treatment sessions of several hours each can be applied each day. PainShield MD can be used almost anywhere and anytime - at home, at work, in the clinic, or even while sleeping. Wearable and smaller than a smart phone, with simple hands-free, one-button operation, PainShield MD delivers its therapeutic ultrasound energy in a completely novel manner. Revolutionary technology miniaturized to fit in your pocket! In a clinical study, PainShield MD reduced abdominal, pelvic, bowel, genital, and bladder pain associated with adhesions, pelvic floor muscle spasm, and the aftermath of hysterectomy. PainShield is a drug-free, non-invasive therapy you can wear discretely under your clothing, at home, at work, even during sleep, to get hours of pain relief. Before having a hysterectomy or surgery to cut adhesions for pain, try PainShield MD.